The perfect comprehensive starting point for anyone looking to conduct research on Montevideo, this historical dictionary is ideal for those who want to know more about the city’s history and development. Offering a concise overview of Montevideo’s history and development, the ‘Historical Dictionary of Montevideo’ presents a comprehensive historical survey of the city by means of an alphabetical list of keywords and names, with accompanying definitions. Both well-researched and authoritative, the volume draws upon a wide range of modern sources, and contains an introductory essay about the city, a chronology, a list of acronyms and abbreviations, photographs and appendixes of supplemental information. 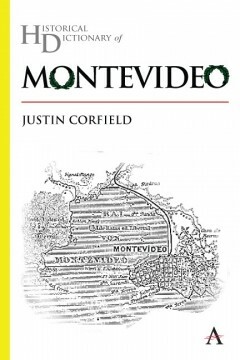 Featuring a detailed array of references, the ‘Historical Dictionary of Montevideo’ is the perfect comprehensive starting point for anyone looking to conduct research on the city, and will be of great use to historians, journalists, diplomats, teachers, students, genealogists and librarians. Justin Corfield gained his PhD in history from Monash University, and has been teaching history and international relations at Geelong Grammar School in Australia since 1993. He has written extensively on Asian history and politics.